New legislation in New York City aims to regulate the use of 3-D printers to make firearms, as the U.S. tries to cope with the possible proliferation online of drawings for making such arms. 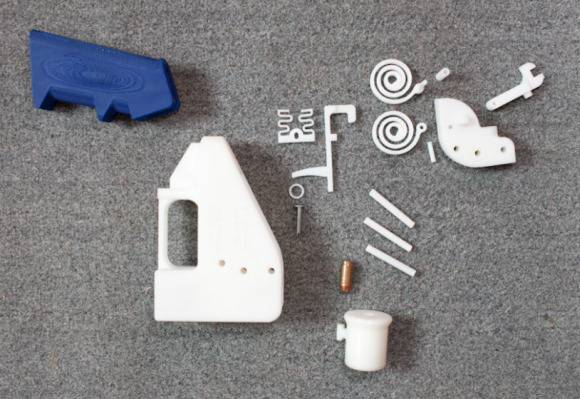 In early May, an organization called Defense Distributed fired a handgun made with 3-D printing technology, and said it would distribute its drawings online. But it later brought down the files on orders of the U.S. State Department. The Texas-based organization now runs a notice on its website that the files have been removed "from public access at the request of the US Department of Defense Trade Controls." (It added that the U.S. government claims control of the information until further notice. The Mega file-storage service, set up by Kim Dotcom, the controversial founder of Megaupload, also removed design plans for the one-bullet plastic gun, citing the legal uncertainty about the distribution of its CAD (computer-aided design) files. But a large number of the files are said to have already been downloaded. The New York City Council this week introduced legislation that would prohibit others than those licensed as gunsmiths from using 3-D printers to make guns and related equipment. The bill aims to regulate the use of 3-D printers "to print firearms, ammunition and ammunition feeding devices." Any gunsmith who creates a rifle or shotgun in whole or part using a 3-D printer must, for example, notify the New York police department and seek registration within seventy-two hours of completing the printing of the arm. Earlier, a bill was introduced in the New York State Assembly "to prohibit the manufacturing, sale and use of firearms and ammunition magazines digitally made by individuals." One of the justifications for the state bill is that 3-D printers "can manufacture objects using materials that cannot be detected by traditional metal detectors, and may not present an accurate image on an X-ray." The production of a homemade firearm or ammunition would also circumvent a number of state laws regulating and requiring registration of firearms and magazines. The two bills are not the only proposed legislation that aims to prevent the misuse of guns made with 3-D print technology. In May, California state Senator Leland Yee announced his plan to introduce legislation to prohibit the use of technology used "to create such untraceable and anonymously-produced guns." New York Congressman Steve Israel also said in May he was renewing his call for the passage of his recently-introduced Undetectable Firearms Modernization Act that extends a ban on plastic firearms and also includes components like homemade, plastic high-capacity magazines and receivers. An existing ban on plastic firearms expires this year, and did not clearly include the components. The gun printed by Defense Distributed had a small metal component—its firing pin—according to reports, but that could be easily done away with it, making the gun undetectable by metal detectors, Israel said.